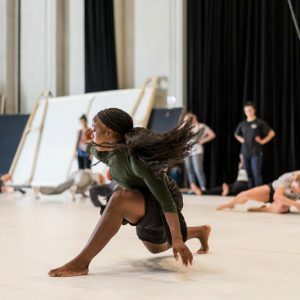 Kristina and Sadé Alleyne presents Alleyne Dance, an internationally touring, innovative, modern, multi disciplined dance company based in London. Kristina and Sadé have worked with many companies across the years and trained in many genres apart from contemporary dance such as African dance, Hip Hop, Kathak, Latin and Circus Skills. They were originally athletes and trained professionally in London. Those experiences have helped mould their dynamic, fast, physical dance style and technique. They teach as a duo and from their different journeys/experiences as dance artists their strengths are now fused together. The Company have been involved with, Dance Mission (San Francisco, USA), GLL Sportathon (London, UK), B40 Youth Group, Academy of Performing Arts (London, UK), CAT Schemes (London/ Nottingham/ Birmingham/ Manchester/ Leeds), Dance 4 (Nottingham, UK), Bird College (London, UK), The Brits School of Performing Arts and Technology (UK), Hot House Dance (UK), Turnstyles (UK), Vocab Dance Company (UK),London Studio Centre’s Saturday Associate Programme, Sanjuta Banerjee Youth Groups, Aakash Odedra, Aditi Mangaldas, GDA Professional Class, Fontys Dance Academy (Tilburg, NL), CodArts (Rotterdam, Belgium), Open Dutch Convention (Amsterdam), Deltebre Dansa (Spain), In Love Festival (Toronto), Karlovac Dance Festival (Croatia) and will be returning to HJS Summer Intensive (Amsterdam, NL), Impulstanz Festival 2016 (Vienna, Austria). Alleyne Dance is currently in creation of their first duet, of which snippets have been previewed at London’s MOVE IT Festival 2016 and have performed in London, Spain, Toronto and Vienna in Summer 2016.